If you have accompanying kids and children while visiting Darjeeling, you must take into consideration their interests as you make your vacation plan in the hills. Not many hill towns in India give you great options for kids & families. But Darjeeling is an exception. This section is about the great places to visit for Kids and children while you too will be able to soak in the enjoyment and nature's lovely offerings. Where else in the country can you find so many opportunities with families & kids like riding the heritage toy train along the steep mountain terrain, visiting a zoological park that features unique & rare high altitude animals, enjoy ethnical dance & cultural programs in a colorfully lighted & landscaped park, take a ride on a cable car with mind blowing views of the valley & tea gardens and many more. Check out the links below for details about the places of interest in Darjeeling for kids, children & families. You can either take a Local Package Tour to visit some of these places or a private taxi from a taxi stand and get to these places on your own. As it moves on narrow gauge track, the steam engine whistles will remind the passers-by to keep a distance. Won't your kids love that? Tell them that this was the first such train built by the British during 1800s which provided a public transport connection in the mountains for the first time in the world. At present, there are two rides in the morning and two in the afternoon each for about 2 hours. 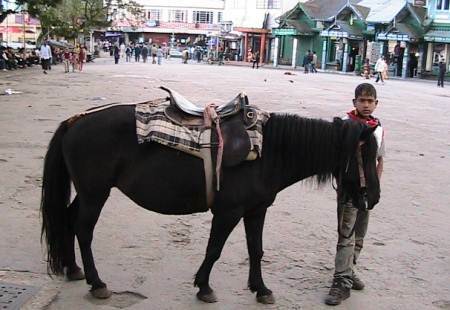 The round trip rides start from Darjeeling station. 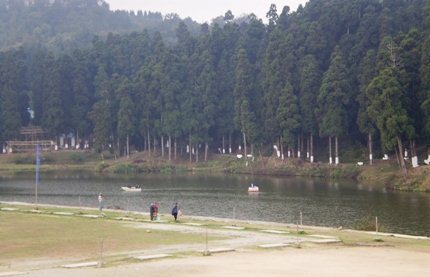 Mirik is a beautiful place surrounded by scenic tea gardens and having a lake as its central attraction. 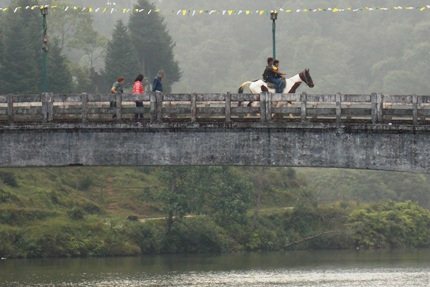 You can hire a private taxi and easily make a day trip to Mirik. It's about 50kms from Darjeeling and takes about 2 hours & 30 minutes one way. You can either plan to take your lunch at one of the several restaurants by the lake side or if you had packed your food from Darjeeling, then make a nice picnic by finding a place on the garden by the waterside. This is a beautiful park with lovely landscapes and manicured garden. During the day time the park is ideal to take your children where they can play badminton and stroll around in the park and soak in the lovely views all around. In the evening as it gets dark, the park is illuminated with multi-colored lights, some hidden, creating a dream ambience. During the high tourist season, ethnic cultural programs like folk dance etc take place at the park which the families can enjoy. The park is located only about 10 minutes walk from the Chowrasta Mall. This is a famous scenic loop that the toy train maked near the Ghoom station. This loop has been featured in a number of Hindi films. As you take a ride along the loop, you will get a panoramic view of Darjeeling including that of Hill Town as well as the snow peaks of Kanchenjunga (on a clear day though). However, this loop was actually created so that the Toy Train could negotiate a sharp drop (or climb depending of its direction of journey) of about 140 feet. This along with many other loops along the toy train route were considered as Engineering marvel which eventually made it possible for the toy train to run on such steep hilly terrain. If you are planning to take the toy train joy ride, Batasia loop would be covered as part of that. 2) Check out Darjeeling Tourist Places to know about many other great sightseeing attractions.